Get started with a great new hobby or craft. Or, advance your existing skills. These how-to guides and simple woodwork projects and home improvement plans should help. 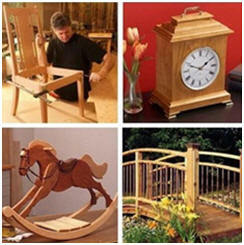 They are all offered by woodwork pros and top publishers. Click on the links below or scroll down this page to find just what you need. This informative website is an online guide to just about everything that a beginning woodworker needs to know. It offers simple projects, free plans, shop jigs and a woodworking glossary. It explains tools and how to use them. It has information on wood types and how and why to select each. 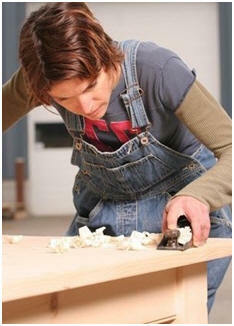 Learn how to work with wood cabinetry joints with these articles from Extreme How-To Magazine. Sixty one informative articles and videos will guide you to the best methods of handling all of your projects. Learn how to choose, glue, join, sand and finish wood. Know just which tools you'll need for your workshop. Learn how to create beautiful pieces of furniture and unique wooden accessories. Create gifts that your loved ones will cherish. 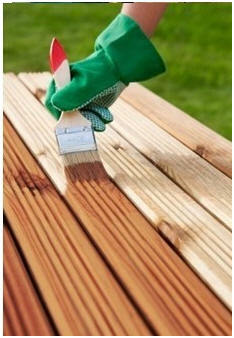 Find out just how to finish, stain, "antique" or paint any wooden surface. Learn how to improve your home with carefully crafted moldings and built-ins that you do yourself. Woodworking is an enjoyable and rewarding hobby. It can also be a profitable sideline craft or retirement business. Get started today with great guidebook lessons. Order inexpensive, practical post-frame barn blueprints, garage plans with lofts and optional add-on garages, carports, storage spaces and workshop areas. Find architect-designed woodshop designs and plans for mini-barns, hobby shops, sheds, backyard studios, she sheds, home offices and more. This online magazine, that is aimed at amateur woodworkers, offers an archive of easy-to-build woodworking plans. Included with each project are all of the plans necessary as well as a detailed how-to lesson on completing the piece. To give you good reasons to use their great finishes, the MinWax Company created a line of woodwork project plans. They offer them for free with material lists, instructions, assembly diagrams, finishing options and safety tips. Anyone can use the plans, but they are perfect for woodworkers who are just getting started at the craft. Each project is a full lesson in necessary skills. Create gifts, home accessories and practical small tools with these easy, illustrated project guides. Use these easy, free project plans and step-by-step guides from Extreme How-To Magazine to get started on your new woodworking hobby. Get started as a woodworker with these free plans from Amateur Woodworking Magazine. Download 1,600 pages of great project plans and do-it-yourself woodwork guides for free. Find a variety of small projects that make perfect gifts or craft-fair products: wooden clocks, puzzles, kitchen accessories, jewelry boxes, duck decoys, bowls, toys, children's furniture, rocking horses, home furnishings and more. 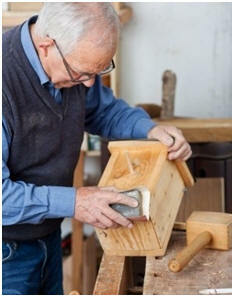 Get started on woodworking projects with easy plans from Amateur Woodworking Magazine. Wood finishing can be fun and easy. MinWax will guide you through the process including preparing the wood, choosing the proper applicator, and applying traditional and one-step finishes. Beautiful results can be obtained easily if you prepare the wood surface to accept a finish, "troubleshoot" before application to minimize problems during the finishing process, and use high-quality wood finishing products. Learn the tricks to perfect finishes for your woodwork projects or around the house with these free guides. Get help with refinishing furniture, antiquing techniques, painting cabinets and more. Get started on your new woodshop, shed, cabana, barn, garage, car barn, hobby shop, carriage house, workshop or backyard studio right now. With one order for just $29.00 you can download professional construction blueprints for over one hundred different designs. You'll be able to download any and all of the plans right away and print as many copies as you need to get permits, to get contractors' bids and for construction. The set comes with a full money-back guarantee. Learn how to install perfect moldings on cabinets and on any room in your home with the help of these free lessons from Extreme How-To Magazine. At LeesWoodProjects.com you'll find dozens of free how-to guides and plans for all sorts of woodworking projects for your home. Among the dozens of free project plans you'll find shelves, storage units, a Lazy Susan, practical kitchen projects, bulletin boards, CD holders, key racks and much more. Extreme How-To magazine provides the latest information on tools, techniques and home-improvement technology for the handyman. Their free how-to lessons will help you build fireplace mantles, library shelves, storage units, cabinets and more. Build a wooden cradle, crib, high chair and changing table for your baby with the help of a free plans list created by ToolCrib.com. To give you good reasons to use their great finishes, the MinWax Company created a line of beautiful furniture and woodwork project plans. They offer them for free as instant download plans with material lists, instructions, assembly diagrams, finishing options and safety tips. Build something special for your favorite child. Find complete, do it yourself project plans to help you with a portable puppet theatre, an outdoor clubhouse play set, stacking book and toy shelves, a classic rocking horse, a sailboat sandbox, children's furniture, wooden toys and games and more. WOOD Store is Meredith Corporation's online do-it-yourself plan service. They are the publishers of Better Homes & Gardens, WOOD Magazine and dozens of other respected publications. They offer over 450 great plans that have been designed by experts, tested for accuracy and built as editorial features for the magazines. Both printed and instant download plans are available at surprisingly inexpensive prices. Choose from thousands and thousands of illustrated, step-by-step project plans and build furnishings for every room in your home, and for your woodshop too. Here are hundreds of the best woodwork project plans for furnishing your porch, patio, deck or garden. You'll find picnic tables, garden benches, Adirondack furniture, barbecue tables, poolside lounges and much more. There's even a unique selection of DIY outdoor furniture that folds up for easy storage. 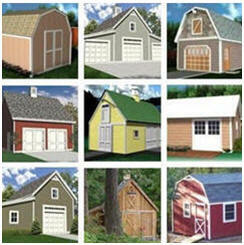 Help yourself to hundreds of plans for sheds, barns, garages, workshops, cabins, cottages, green homes and backyard structures, offered for free by some of the Internet's top designers and publishers. Then, check out our lists of thousands of free, do it yourself home improvement and backyard project plans too. 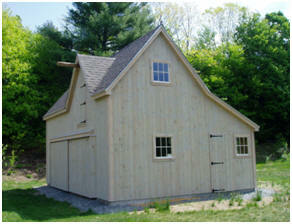 Find plans to help you build the perfect woodshop for your hobby or business. Check out our lists of practical and unusual designs.